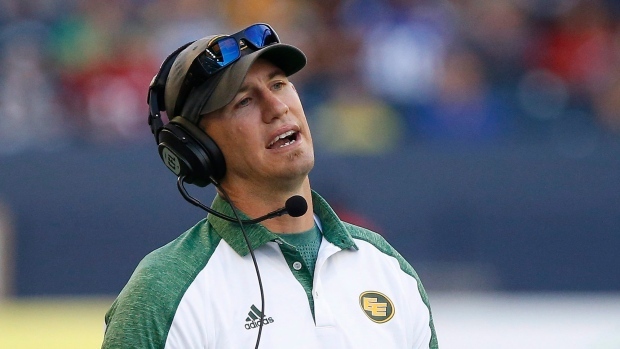 The Edmonton Eskimos have been fined $20,000 and head coach Jason Maas $15,000 for refusing to wear live broadcast microphones during their win over the Montreal Alouettes on Monday. Quarterback Mike Reilly and Maas, the pair scheduled to mic'd for Edmonton, both decided against wearing the microphones prior to kickoff. It was unfair to our fans, who had been promised a live mic game, to our broadcast partner, who had advertised a live mic game, and to the other clubs in the league who had abided by the Board’s directive to participate in live mic games. It was totally unacceptable. The Eskimos organization acknowledges this and has apologized. Still, it has a responsibility to ensure its employees do not see themselves as above the league and what its Governors deem to be in the best long term interests of the league. For this reason, I am fining the Eskimos organization $20,000. It is also important that Coach Maas be held personally accountable. I am fining him $15,000. The fact that Coach Maas has expressed no remorse whatsoever for what appears to be a unilateral and planned act of defiance is particularly disappointing. I want to send a clear signal that this cannot happen again. Should Coach Maas be directed to wear a live microphone again this season or in subsequent seasons, and he again refuses, he will be immediately subjected to the maximum fine allowable and he will be suspended for his team’s next game, even if that next game is a playoff or championship game. No individual, or group of individuals, is more important than the well-being of the entire league, and there must be respect for the directives of those empowered under our Constitution to lead this league. I want to stress again that acting in direct contravention of a Board mandated directive cannot and will not be tolerated." Eskimos president and CEO Len Rhodes issued an apology after the team received the fine. "Last Monday, our football club failed to honour the commitment we had previously made to the league to follow through on the live mic broadcast," Rhodes said in a statement. "By failing to act on our commitment, we let our peers down across the league. For this, we are sorry and we sincerely apologize to our league, our broadcast partner TSN and to CFL fans from coast-to-coast. "Today, the commissioner has levied significant fines against our football club and our head coach. We respect and fully support this decision. The long-term interests of our league as a whole must always supersede the interests of any individual or any one team." Reilly said after Monday's game he felt wearing the microphone would hurt the football team. "Honestly, it was something that after we talked about it all week, I decided it was something that we didn't feel comfortable with doing, to be quite honest," Reilly said. "That's all I can really say about it. When you're on the field, you're trying to play football and it turned into something that was going to be a big distraction and something that I felt was gonna hurt our football club. "So, honestly, I tried to do what's best for the team, best for me out here playing, and that's how the decision was made." Montreal Alouettes quarterback Rakeem Cato and head coach Jacques Chapdelaine both wore their microphones, as scheduled, for the broadcast. The Eskimos won the game 40-20. Reilly was asked about being mic'd up before the game and said "they better be ready to bleep stuff" but did not express a problem with the idea. The Eskimos are on bye week this week. The team will return to the field on Oct. 22 against the B.C. Lions.